“Calling occupants of interplanetary craft!” Well, it’s better than the “CQ, CQ” call we used to use with my cousin’s ham radio back in the ’60s. Worked just fine for human earthlings, not so much for intergalactic aliens. But maybe it was because we just weren’t in the right place. Now I live in place that might be right, or so some people have said. Not much concrete evidence to support the claim, but claims have been made anyway, and the investigation continues. Sounds like politics, doesn’t it? 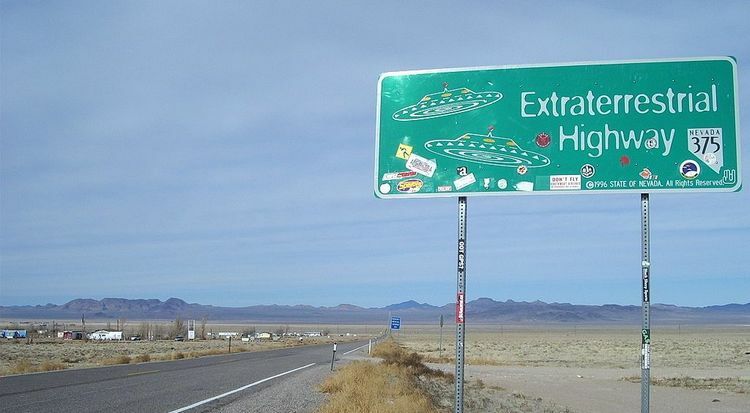 The right place, some would say, is along Nevada’s E.T. Highway. Yes, Virginia, there really is such a road. Officially it is state route 375, but local folk like to call it the E.T. Highway. Easier to say anyway. 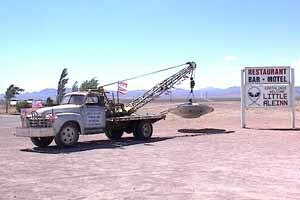 For quite a long time, rural Nevada, at least this part of it, has been the place for prospectors and Westerns, nuclear testing, Air Force Red Flag excises, Army and Air Force missile evading games, and aliens and UFO’s. Geocaching was popular for a time, but that seemed to be only a passing fad. It is also home to the Nevada Test and Training Range, the official name nowadays for Area 51, something the CIA only admitted actually existed a few short years ago, although most everyone already knew it did. Aliens have been known to come into one of the nearby stores, a truck stop and fast food place. Sometimes they would even bring their kids. Just south of Hiko, at the junction of SR 375 and SR 318 (the picturesque oasis of Crystal Springs), and headed toward Tonopah, the E.T. Highway is about 100 miles long, running east to west, or the other way around. Cows live out there, and precious little else. There is even a place called Railroad Valley; however, I have never been able to discover if ever there was a railroad within 50 miles of the place. Some 30 years ago, Life magazine published a story by a writer who claimed that U.S. 50, from Fallon to Ely to the Utah state line was the loneliest highway in America. Au contraire, mon ami. It is doubtful the writer ever traveled SR 375. You want lonely, there it is. Try it yourself. But do watch out for the cows. They are not impressed by aliens in the least. Manager Dixie Scarboro has Space Station Garlic, Terrestrial Teriyaki and Hell Hole Hot Jerky. When it says hot, he means it! Westward down the road about 45 miles or so, is the Little A’Le’Inn. A catchy name, don’t you think? Owned by Pat Travis-Loudenclous and her daughter Connie West. It’s at Rachel, Nevada. This is about as close to Area 51 as normal folks are going to get. Sure, you can try, but you’ll be turned away by Air Force border guards. Do you really want to risk the other side of being arrested? It’s a nice little place, a friendly bar and grill with good food. Try the Alien Burger and the Alien Amber Ale. There is also a gift shop and a motel, not fancy, but adequate. If you don’t stop at the Little A’Le’Inn (but please do), out front you can see a white 1948 Chevy crane dangling a space craft. And if you’re there at the right times, you might hear sonic booms. Don’t pay much attention to those though, it’s just the jet planes out of Nellis Air Base in Las Vegas cutting up a little bit. Who knows why and who cares? Probably gives the pilots a kick to do that every now and then. You know boys and fast machines. No offense to the equally excellent lady pilots, if any. E.T Highway continues west to Warm Springs, the junction with U.S. Highway 6 coming out of Ely. Don’t try to stop for gas there. It’s completely deserted, except for the cows on the adjacent range. Big horn sheep have been known to frequent there also. Just keep on going: Tonopah is only about 50 miles farther west. So, next time you are passing through Lincoln County, remember the old TV jingle, “See the U.S.A in your Chevrolet,” or whatever vehicle you might be driving, or at least along the E.T. Highway. Judge for yourself just how lonely it can be. Pretty on a clear night though, with all the stars in the heavens.